When walking around Harvard University area, you are struck by the amount of early American architectural history in one place. I decided to write on some of the buildings on the campus built during three centuries. 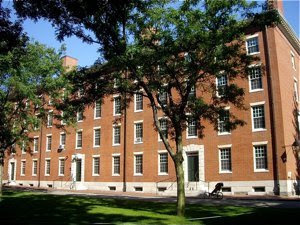 One building from the 19th century is Holworthy Hall, enclosing Harvard Yard. Here is a short story found on a memorial plaque on the house. 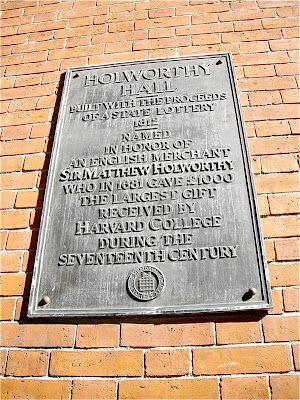 Holworthy Hall is a large red brick building still used as a dormitory for first year students at Harvard College. It has a superb location close to Harvard Square and is surrounded by large trees and green lawns. Holworthy Hall has been the home of several famous Americans as the writer Thomas Bulfinch, the TV presenter Conan O'Brian and the billionaire Howard Hughes.